If you are on a short vacation or a weekend break, make sure to spend some time discovering the unique beauty of Riyadh. Enjoy the sunsets and the clear moonlit nights; appreciate the diversity of the natural environment, visit the historical and heritage sites, shop in the most luxurious and largest shopping malls and complexes and experience the popular local sports. Riyadh is the tourism and business destination for a visitor who is seeking Arabian hospitality, excellent tourism services and a superb shopping experience in the most magnificent and modern malls. Visitors can also enjoy delicious and unforgettable meals at the variety of fine restaurants and cafes. In addition, Riyadh features a cluster of natural sites like gardens, parks and wildlife reserves, which provide visitors with fascinating and relaxing places to unwind. To extend the trip for a few days, you can also discover the diversity of the surrounding areas such as the Eastern Region, Al Ahsa, and Al Qassim. 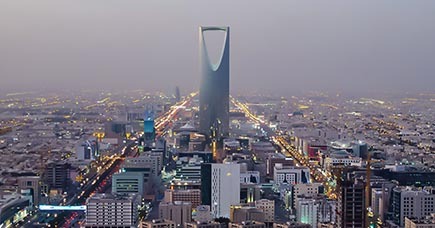 The city of Riyadh is both a modern metropolis and a historical and cultural treasure. Its characteristics are diverse, that range from the shimmering golden sand dunes, to modern shopping malls, distinctive heritage and cultural sites to urban construction panaches. Such diversity makes Riyadh city the core of life and vitality in the Kingdom. Visitors to Riyadh can travel through time and discover the most beautiful heritage and cultural sites. For instance, the historical Dir’iyah is one of the “World Heritage Sites” that preserves the history of the Kingdom through its old buildings, ancient forts, and historic villages, like the Al Ghat historic village. There are many magnificent landscapes and natural environments to enjoy, such as “Wadi Hanifah”, a spectacular natural site in the Riyadh region. The village of Ghat heritage tells the story of the past heritage. The Amara Palace is a masterpiece of architecture adapted to the Islamic style architecture. Moghairan historical castle on the west bank of Marakh valley is a site that contains many carved inscriptions and rock art dating back to the period between 900 BC - 400 AD. The cave is situated at a distance of 66 km northeast of Riyadh city. There are many inscriptions craved on the rock faces, and specialists from SCTA have reproduced about 15 engravings, and the oldest one dating back to about 2,400 years ago.